Prior to an anticipated Haitian election in January 2016, which was later postponed, the Provisional Electoral Council (Conseil Electorale Provisiore, or CEP) coordinated with the International Foundation for Electoral Systems (IFES) to recruit, interview and hire two persons with disabilities to work at the CEP’s call center. 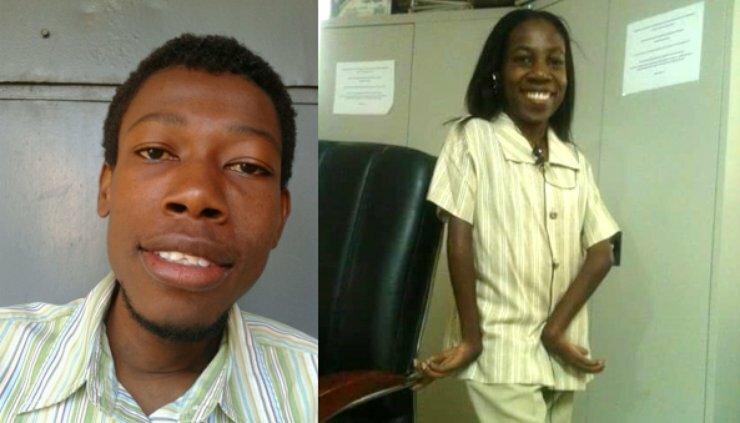 The new employees, Mildred Latortue from Port-au-Prince and Marc Sony Toussaint from Bros Morne, share their experiences working at the call center and their suggestions for political inclusion of persons with disabilities. Mildred Latortue began working in January 2016, in the week leading up to an anticipated election on January 24. Her job, like Marc Sony Toussaint’s, was to receive calls from voters trying to learn which polling center they were assigned to. She would enter callers’ voter identification numbers into a database that would bring up the polling center name. She described her job as a positive experience. Though Marc Sony agreed that he enjoyed working at the call center, he did mention it required some patience as occasionally callers were a bit rude or aggressive. In 2015, Marc Sony voted for the first time in the August 9th legislative elections. He did not encounter any challenges while voting; however; he did not vote in the Presidential elections and runoff legislative elections on October 25th because he was nervous about going out to vote after learning of the violence and aggression that took place during the August 9th elections. In the case of Mildred, who is a registered voter, she has never voted because of the history of violence in previous elections and crowded polling stations. Both operators would like to encourage changes to the election process in Haiti to support voters and candidates with disabilities. For example, they suggested having election awareness campaigns to encourage persons with disabilities to join elections as voters and candidates, and also to educate the general public about what persons with disabilities can do. They also mentioned that polling places could be closer to the residences of voters with disabilities, and that more polling stations should be made accessible for persons with different types of disabilities. In particular, they recommended having someone at the polling station who could understand sign language, and having a designated person at polling stations to assist voters who are deaf or have a visual disability (the current law states that persons with disabilities can choose someone of their choice to assist them in voting, but sometimes family members or friends are not available to assist).